I'd been dreaming up creative openings for the blog post for a year. I was thinking about: Have you seen the startlingly attractive woman talking about her autistic son on Paul McCartney's latest DVD, The Space Within US? But it's not to be. Paul McCartney's latest DVD is on the shelves, but it doesn't include me. 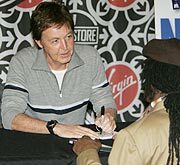 Last fall, I went to see McCartney as he toured the country promoting his most recent album, Chaos and Creation in the Backyard, and like all slightly manic fans I waited patiently by the gated back entrance to catch a glimpse of him as he zipped past in his limo. While I passed the time with a crowd of warm-hearted, like-minded crazies, McCartney's videographer (I recognized him - how pathetic is that?) wandered out with his cameraman and started interviewing some people in the crowd. I listened from afar, and imagined what I would say if I had the opportunity. The videographer said to the cameraman, "Let's do one more," then he looked up and, from the other end of the crowd, locked eyes with me. Horrified, I instantly broke eye contact and looked away, but he walked directly up to me and said, "Can I ask you a few questions?" He asked me some sort of open-ended question about why I was there that evening, and I started telling him about Bud - about how much Bud loves Paul McCartney - about how Paul's music is something that Bud and I share, something that connects us - about how Bud watches Paul's last concert film constantly - about how, though language has always been a struggle for him, music has been second nature - about how, even before he could talk, Bud could sing Band on the Run - about how, even though Chaos and Creation had only been out a few weeks, Bud already knew all the lyrics - about how, despite all this, the sights and sounds of a concert would be scary and overwhelming for Bud - about how I was there that night for both of us. Halfway through the interview, the videographer asked me to stop and start again with a clear opening that would make a good soundbite ("My son Bud is six-years-old, and he has autism...") I don't remember exactly what I said, but my friend says I was concise and articulate. I've spent the last year trying to convince myself that with the thousands of hours of footage they'd taped I wouldn't have a chance of making the final cut. But I secretly hoped that when Bud and I sat down to watch the DVD, he'd see the camera cut away from Paul and cut to me talking about Bud. I haven't watched the DVD yet (I'm saving it as a special Thanksgiving weekend treat to share with Bud), but my best McCartney-concert-going friend has watched every second, and has scanned all crowd scenes for even a glimpse of us. Discerning fans will note that Paul has abandoned the light brown hair dye for a more natural, more flattering dark brown. Now all he needs is a better video editor. Cool. Very cool. I hope that some day Bud can enjoy a concert, too. But you told us all about it here---just as good as the DVD! I can't believe they didn't use you! All I can say is that whatever they went with had better be good! their loss - they probably didn't want something as 'deep' or 'real' as you - stupid. pretty cool that they actually interviewd you though, huh? By the way, my husband and I were out in Vegas last week and saw the Cirque Du Soleil show "Love" with all Beatles music. It was awesome! I bet you would love it. 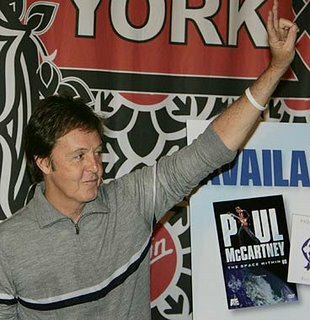 Its funny you mention about Bud being a Paul McCartney fan. During the show, I thought of how much my son would love to see it. Total sensory experience....particularly visual. I bet he would get a real kick out of some songs like, "I am the Walrus" and "Yellow Submarine". (Not to mention how I could see him with a future in this sort of performing industry where the actors not only need to be good at memorizing lines, but jumping around on trampolines and swinging from swings way up in the air, etc. )So we returned from our trip to Vegas and began playing some Beatles for the kids. Of course they love "Oh-Bla-Dee-Oh-Bla-Dah" particularly because ny daughter's name is Molly. But anyway, they have become big Beatles fans too. I wonder if its nature or nurture that creates these things we have in common with our kids.